Talking to John Goubeaux is a lesson in positivity, but it shouldn’t be. John nearly died seven years ago. He will forever have the scars from that day – the ones you can see, and the ones you can’t, but slightly detect while speaking with him. John takes great pride in his years spent working to keep pilots and passengers on military planes safe. He worked more than two decades directly on aircraft while in the Air Force. When that career ended, his service continued through a civilian job on Pope Army Air Base. During a steaming summer day in 2011, as he stood on the back of a truck working on a plane, the stifling heat and humidity overtook John. He collapsed to the ground, landing head-first on concrete, shattering part of his skull. Paramedics rushed him to the hospital, but the swelling on his brain had already started. What John doesn’t remember is his wife Vicky’s anguish. John is lucky to be alive, and he knows it. “I don’t take anything for granted,” he said. 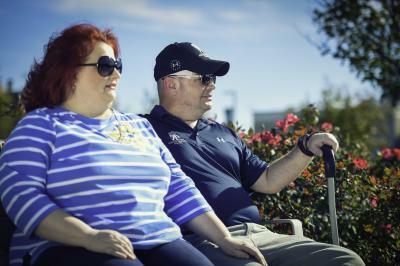 John still lives with a severe traumatic brain injury that slows down his life and has him relying on Vicky to be his caregiver 24 hours a day, seven days a week. Doctors told John his life would be one of limitations: no bicycle riding – a favorite of John and Vicky before his injury – no taking the stairs, minimal activity, and inability to taste food. Then John learned about an organization dedicated to improving the lives of veterans – helping them achieve their highest ambitions. Injuries he previously sustained while in service made John eligible for the free services and programs offered by Wounded Warrior Project® (WWP). John was drawn to WWP – whose service-driven approach provided him and Vicky new opportunities. WWP also brought John into its Independence Program, an innovative approach to help the most seriously wounded veterans and their families. Independence Program helps veterans with moderate to severe brain injuries, spinal cord injuries, or neurological conditions. WWP knows every warrior can achieve a life worth living when given the right support. WWP works with each warrior and his or her family to develop realistic goals and a plan to reach those goals. Independence Program connects these warriors with social and recreational opportunities, education opportunities, and other life skills. In many cases, these efforts empower warriors to achieve additional healing in their recoveries, improving their lives and their family’s lives. For John, his life coach and other support staff have helped him reach new heights. Worked on it they did. Step-by-step, John relearned the task and built his stamina. But John is not just celebrating small steps; he is tackling every challenge that comes his way. Doctors originally told John he would have to stop riding a bicycle. Before his injury, John and Vicky would ride bicycles together. After what doctors told him, they sold their bicycles. Through his recovery with WWP, he is not only back on a bike, but has gone more than 3,000 miles in about two years. John was reintroduced to the joy of cycling when Independence Program helped him join a Soldier Ride® in late 2015. John and Vicky spent three days with other warriors building camaraderie through physical activity. John’s positive spirit shined that weekend, so much that he was awarded a recumbent bicycle, which gives him the ability to fully sit down while cycling. WWP’s Soldier Ride team was so moved by his story and bright outlook that they also provided a bicycle for Vicky, so husband and wife could ride together again. The cycling helps them both. “Being able to ride together brings us closer together,” Vicky said. Independence Program has helped John in another way. He is dealing with never being able to work again. And with the help of his life coach, he is finding a renewed sense of purpose. John is no longer working on aircraft, but he is taking great pride in working with his hands again. He spends parts of each week going to thrift stores and finding items to repurpose. Whether it is old baseball bats that can be fashioned to help break in gloves, or silverware tied together to make wind chimes, John is helping discarded items find new use – a process he relates to. Those wind chimes also find new homes with other wounded warriors who are on different parts of their journeys to recovery – a reminder that no matter the challenge each individual may face, no one will be discarded. Every time the wind blows, the chimes gently clink and provide the inspiration to find new purpose – breathing new life into warriors who may be struggling without purpose. John’s positive approach is contagious. Anyone who spends time with him leaves feeling better about the challenges they face and their opportunities in life. Despite how his injuries have changed his life, John knows the fall and aftermath improved his outlook. While his traumatic brain injury creates limitations, it does not distance him from opportunity. John just knows he must work at it. WWP has been serving those who sacrificed for 15 years. The veterans charity meets warriors where they are in their recoveries – connecting, serving, and empowering them to live on their terms.